I wanted to start with an observation about your style of communication. I’ve worked with you on two or three pieces now (depending on whether we call the two versions of “Playground” one or two pieces), a couple of improv sets, I’ve watched you working with other players, with my students, and with Studio Musikfabrik. It seems to me that everything you communicate about in your music, or in any music, is metaphor and narrative, and that any moment, or opportunity, or problem you observe, you communicate about with an image, or story, or character. Were you taught this way? Or is this kind of communication a conscious decision? Thank you very much for this question. It is something I’ve never been asked before. When I hear or create music I interpret it as a channel of communication between subconsciouses. It is a place where imaginative minds converse. Metaphor is one way to do that. I was not taught in this way. Not at school at least, but I think it has a connection with the way I used to communicate with my parents, who are not musicians, about music. When I work with musicians, ensembles, students and collaborators, I am trying to show that music is not only a production of sound, but a whole world of physical and metaphysical depth approachable through many points of view, many connotations and connections at the same time. If there is a story/narrative in my work, it is of these multiple views intertwining, struggling, affecting each other, back and forth. I often explain my music to players by putting them in a situation where they imagine their limbs to be separate beings, and objects to be characters, because the narrative, although never being stable, is in the relationship between these. They all affect each other and sometimes the puppet is indistinguishable from the puppeteer. In a sense, the same can be said of the relationship between music and choreography, intention and outcome. Part of the reason for choreography is to destabilize the listening (and performing) experience – that the sound alternates between being a designated result-to-be-achieved, and a consequence of physical forces, or both, or not quite either. Nothing happens in isolation. Even my experiences experimenting with materials merge with the materials themselves. I find that when I teach, it is always something I try to communicate: the complexities of being in process. Ever-changing-ness is what I see in the world. The pieces themselves, although set in structure, always come out slightly differently, both due to the occasional interpretable instruction and unpredictable outcome, and probably because the metaphor is always on the move. Music is the trail left behind. Interesting…I’ve wanted to ask you this question for some time, because I was taught that way, where stories and metaphors are valued and add artistic validity to an assertion. I associate that kind of communication about music with an old, European kind of pedagogy (perhaps incorrectly); at least it is the kind of teaching that came down through Segovia and Oscar Ghiglia. In the context of common practice music I always felt that it added a kind of validity that “objective,” or scientific, or rational communication lacked. It was as if, if you can make it a story, it is connected to the tradition through some kind of (perhaps arguable) commonness or archetypal imagination. But if you try to make a scientific argument, or even a rational argument, you’re imposing something potentially irrelevant and counterproductive onto the music and the tradition. I like that you approach new music this way; to me, it feels like it validates that new music is shared and spontaneous for people who are alive today; if we can talk about it in stories and metaphors, there is something true or resonant about it for us. My music theory teacher, and one of my most important mentors, Candace Brower, was very interested in metaphors as a fundamental mechanism for cognition, in particular embodied metaphor. So the music theory mentality I was taught (or, I should say, that I learned, to absolve Candace of any errors of mine!) was always that if you can’t feel the concept in your body or imagine it as a physical experience, it might be a misguided concept. To me this always fit well with Oscar’s storytelling. Experience the observing itself, how it moves, where it wants to lead – maybe this is what a metaphor is: relating an observation as an experience. I am intrigued by the metaphor and its creations and mutations and associations. An example of a metaphor: I sometimes think of a piece – or the process of making a piece, which might be represented in a piece’s structure – as associations that both reflect and confront each other, much like I view the Internet as a single organism always updating its search results, or a brain trying to understand itself. An important part of a metaphor is the encryption at its core. A metaphor is an observer, always an outsider, not a center. It’s what the subconscious deals in. One leads to another. For example, in Hack, the player – while pulling the woven fishing-line (in-between the two guitars’ strings) from side to side – should imagine that the sound comes from a far away city with people and cars. In this process they need to listen, to continue imagining, to associate and reciprocate. Or I might suggest that a performer’s hands turn into two birds, biting the strings as if it were their prey. Something of that energy, that particular association, carries into the sound result. I very much adhere to Candace’s “if you can’t feel the concept in your body or imagine it as a physical experience, it might be a misguided concept”. This kind of work creates a momentary narrative or image, which the audience can fly with according to their associations and imaginations. I used to analyze my compositions-in-progress with Chaya Czernowin, throughout my PhD studies at Harvard. We sometimes talked of music in the context of gravity. I would relay the imagery that comes to mind and we would analyze the physical parameters they contain. This method helped me to play with mimicking elements thereof sonically and structurally. These reconstituted images – shapes and colors and mass – are very much present to me in the music. When I talk about my music, I bring back this imagery. I also find it useful when teaching theory. Dissonance, for example – I might ask students what they understand it to mean and we’ll collect examples of dissonances in social relationships, reportage of political events, dreams. What might cause a dissonance? What does it feel like? Why do we want resolution and what might resolve things in each case? I find it a great foundation for introducing music concepts, as well as creative tasks utilizing sensory experiments. This feels like a good segue to another topic in your music that you call “puppetry.” Could you talk about what this word means in your music? A recurring theme in my work is systems operating under the surface; concealed places from where invisible strings are being pulled, influencing appearances. I envision something that is not layered by a visual aspect, a sound aspect and a narrative aspect, but rather one vision, which has, simultaneously, implications in the narrative, in the visual and in the sound. Puppetry is when a gesture – musical or otherwise – takes over. A musical mismatch may be initiated by dividing the organs involved with the playing into separate entities, each of which receives a task. The extent to which it relates to a designated outcome varies from piece to piece. The combination of instruments can also become a puppet; separate entities collided into one, changing into new roles and acquiring strings. However, puppetry does not necessarily refer to a master-servant relationship, or, if it is to be seen as one, it might be said that the puppeteer is also the puppet’s puppet. Their relationship is absurd – playful and tense. To me, puppetry is the alienated, unexpected visitor taking us for a moment to their own world. Control is at the center. Control might be an illusion. Of course the relationship between composer and performer can be seen as puppetry, both ways around. But the instruments can also be a puppeteer, just as readily as their players. It can be the one controlling the player’s movement. Perhaps they are operating each other. At the same time, they have complex relationships to all the other players and their respective sound results. Puppetry itself comes to the fore as these relationships evolve. Because associations keep changing, there cannot be a fixed consensus, or a defining proof, or emphatic truth. As with politics and life, each piece is in a perpetual state of process. Hack, with the two guitars literally woven together with a bass piano string and fishing line, seems to me like continuous puppetry by this definition, where any action has effects on the whole apparatus. In a way the narrative of the piece is about puppetry as well, as I am controlling the protagonist’s mind through his computer. Monster also seems to me like a piece rich with puppetry, where the water, the spring, and the wind up toy are by necessity acting out of your control. Absolutely. Hack – also an ambiguous term – is very much concerned with the taking control of another entity. The performer uses the connectedness to “steal”, or “hack into”, the amplification of the electric guitar. Once successful, the classical guitar transmits through it, using the woven piano string as conduit. Later on, the player steps away from the guitars and bows an almost invisible fishing line. In that moment two aspects of puppetry are at play – the sonic manifestation of the “hacking”, and, in the visual and sonic sense, especially when the light is just right, the apparent production of sound from bowing thin air, the invisible or abstract connectedness. The puppetry in this piece is a choreographed back-and-forth between the operating systems themselves. The player eventually becomes part of the unifying system, giving voice to their dialogue. In How to Make a Monster the player undergoes a similar mutation, at first seemingly just a puppeteer, but eventually incorporated – in this case captured – by that which it sought to control. There is a constant change of roles between the operated and the operator. Puppetry is political. Something I’ve noticed, working with you on Playground and Hack, improvising with you, and watching you work on Monster is a continuity in the way you work. It feels like every action is the direct consequence of the previous action, and necessarily results in the following one, like a flow that would rather not get interrupted or chopped up. Whenever I ask you about a part of one of these pieces, you always start before and end after. When I watch you work, it seems to me that you work this way as well: in large, continuous sections, and that the piece wants to be a single giant section. Is this a natural way for you to work, or was it a conscious decision at some point? During the process of creation, each piece goes through many drafts, through which I learn about the materials. Initially, as I test the range of physical properties, it is not being thought of in time. I simply observe outcomes that have their own timing, and that timing changes as I discover more about the material and relate others to it. Towards the end of the process, I have developed a deep relationship with each material. Instead of keeping only the final draft, I construct a piece by collecting from all the different stages of my engagement and reconstitute them irregularly. Each part of the process has its own qualities. The linking of qualities in different stages of development is an example of a structural concept I call waves of qualities, whereby sounds and patterns undergo a mutation, ultimately splitting into new threads. In this way, hypothetically, a squeak could eventually become a drone, and still have a thread connecting them. Importantly, this does not necessarily develop in a linear way within a piece. Instead, almost like a cubist painting, the material is fragmented and reconstructed from different angles, distances and focal points. The passages I end up including in the piece are not necessarily the most poignant or sophisticated. I combine parts that are very raw, with parts that contain more knowing, and the range in between. The things that happened during the making and the observing, while waiting and thinking, doubting, frustrated, possibly give rise to comical accidents. The relationship between me and the material creates a new material – an alienated material – that I also use through gestures and creatures, reflecting the story of the composing back from on stage, creating another wave of qualities. In the last few years I have developed my work with the aim of merging different fields and mediums in new ways, which is to say that the composition, choreography, objects, images, sometimes also text, design, and the score itself are all part of the same creative process. I might start to communicate through sound, which becomes a visual representation, turning to an interaction between action and sound, choreography, all playing with different associations – traditional musical gestures, or cooking, games, relationships, even military action, or ambiguous concepts such as “aliens”. In How to Make a Monster the nonlinear chain of associations always has a link to the main topic of the piece – monsters and their many forms – by a mysterious inner logic. However, I don’t see it as one line with a beginning and end, but rather like many-legged creatures, entangled, intertwining, capable of becoming something else. Another way to view it is as a war of perception, akin to those in news media. Or a Google search taking on a life of its own. Ever-changing-ness and simultaneity are key. 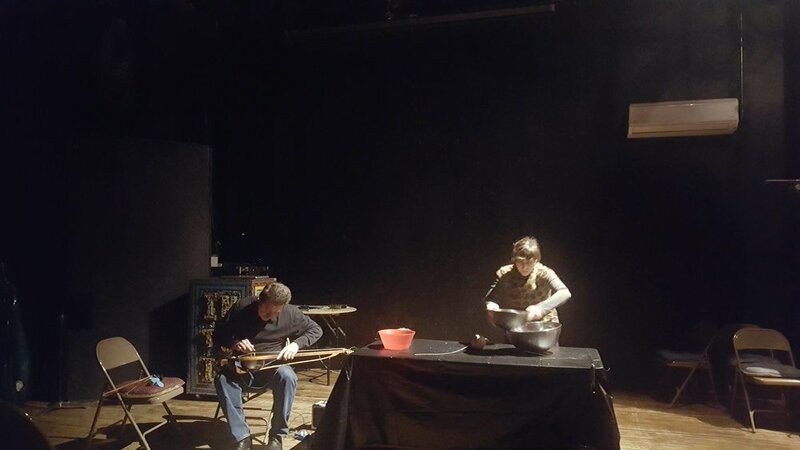 Jesse [left] and Sivan [right] improving for the FLAK series at Inuit: The Center for Intuitive and Outsider Art. Jesse Langen is a guitarist who specializes in new music. He works with living composers regularly and premieres dozens of pieces every season. Equally comfortable on classical and electric guitar, he seeks to push both the technical boundaries and the conceptual functions of the instrument. He can be heard regularly in Chicago, throughout the US, and abroad as a soloist, as the guitarist for Ensemble Dal Niente, in the trio Pesejet with Mabel Kwan and Carrie Henneman Shaw, as half of Hasco Duo with Amanda Deboer Bartlett, and in duo with harpist Ben Melsky. A passionate and committed teacher of high school musicians, his students populate the finest conservatories and programs throughout the world, and have won international competitions and commissions. Jesse and his brother Tim also grew up learning Canadian fiddle tunes from their grandfather Clarence, and he plays Irish music regularly in pubs and at sessions throughout Chicago. A reflection and thank you inspired by Dal Niente’s Piece Her Together, featuring Katherine Young’s When Stranger Things Happen and Eliza Brown’s The Body of the State. In the last installment of Imploding Signs, Eli shares his zine “On Cultural Struggle: Artistic Militance and the Abolition of Value” to break down how his analysis of symbolic violence functions influence his artistic practices.